After the fun of the pit lane walk last night, this morning we awoke and headed straight to our usual Breakfast spot – Kopitiam Food Court on Bras Basah Road. You really can’t beat it for value or variety. This morning was the usual, Kaya Toast with 2 half-boiled eggs, Kopi, and also a couple of BBQ Pork Buns – and just cause I was feeling particularly rich some lovely Shrimp Dumplings! Amazing! All this for less than about $10. Ok so we jumped on the MRT and went to Little India. We thought today we would start exploring that part of town. We met up with the others and headed down Racecourse Road then Serangoon Road. Little India in Singapore is a really colourful eclectic collection of shops and restaurants. You really need to give yourself a bit of time to just wander the streets and sample a little bit of everything. For the ladies it is a great place to get a bundle of Indian costume jewellery at a great price, and down the Little India Arcade are a few little gems – the wife has been coming back to the same shoe shop for years now, they sell great shoes (don’t ask me what type – they are shoes!) at really good prices. But if you really want to do some serious shopping – and I mean serious 24 hour a day 7 day a week shopping – in Little India, there is only 1 place – Mustafa Centre. This is a massive, sprawling “place” that is about 5 floors (I lost count) and spreads almost an entire block. It sells everything! I mean everything- Clothes, Food, Electronics, Sporting Equipment, Fresh Fish, Jewellery, Watches; It is really big – almost too big, you can get overwhelmed just trying to navigate what seem like never ending aisles. I managed to pick up a pretty cool Watch that I had been looking at for a while – and at a pretty serious discount compared to most of the other shops in Singapore. Next stop was lunch. We headed to Komala Villas Restaurant, from what I had seen online it had pretty good reviews. It is a Vegetarian Restaurant but don’t let that put you off – the food is amazing. 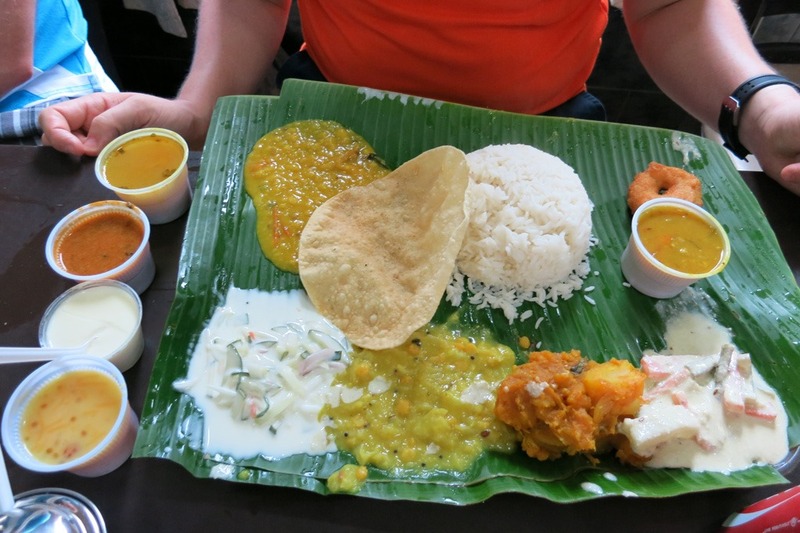 Served “Banana Leaf” Style, in that the meal is served on a Banana leaf and you eat it with your hands (or if you are too intimidated you can use cutlery). It is funny after being told by your parents to not play with your food and not eat with your fingers – it is pretty tough! That was my amazing plate of food. A sort of sample platter of a variety of Vegetarian Curry. The key with eating is just to smoosh it all together and try to clump it with the rice (that tended to work). After a few minutes you actually get the hang of it and it can be a quite efficient way to eat. 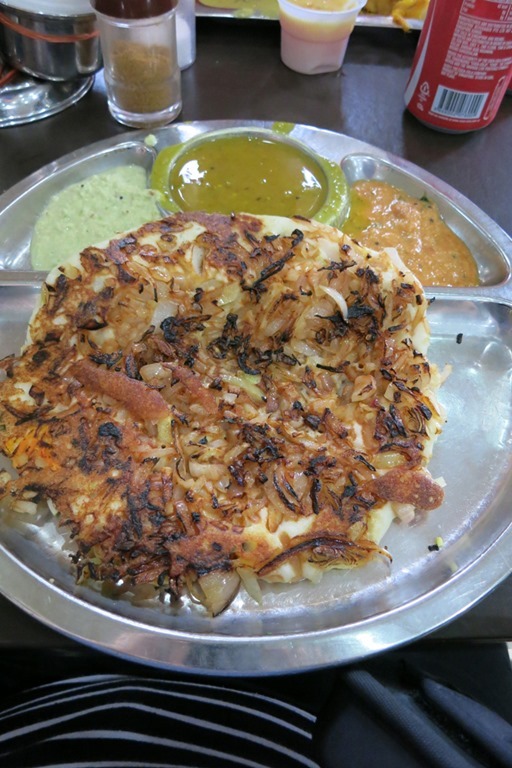 This was a kind of awesome Prata/Roti meal – sorry I didn’t pay more attention to what the others were eating! After filling ourselves at Little India we headed off to Bugis to have a bit of a look around. Now when you are in the Bugis area there is one thing you really have to have on your agenda each day! Ice-Cream Sandwich. 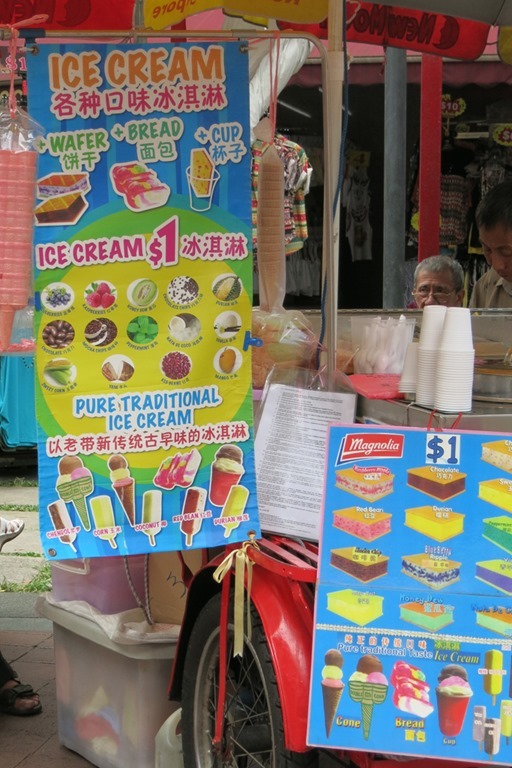 You will see the lovely old Uncles with their ice-cream carts throughout Singapore – but as a little tip the ones at Bugis are the cheapest at $1 each, and great fun to have a chat with. Basically you choose your desired flavour. They do have some “unique” offerings – might be a good chance to try that Durian you have been looking at for so long. My personal preference is for the Chocolate Chip or the Vanilla. The wife loves the Mint Choc Chip. At it’s most basic – you get a slab of Ice Cream and it is served to you either between two wafer biscuits or a slice of bread, you can also get it in a cup if you are that way inclined. The wafter option is best – in my opinion! 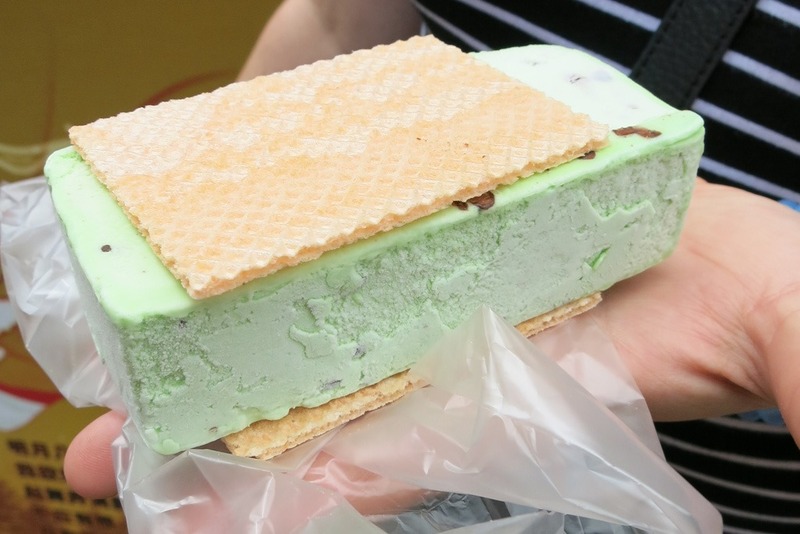 Singapore Ice-Cream Sandwich is a staple meal for us, usually we must have at least 1 per day! And it is especially handy that we had to walk past this place on our way from the Ibis Bencoolen to the Bugis MRT at least once or twice a day. You can find the Ice-Cream vendors in the mall area out the front of the Albert Court Food Centre. Do have a look around this area. 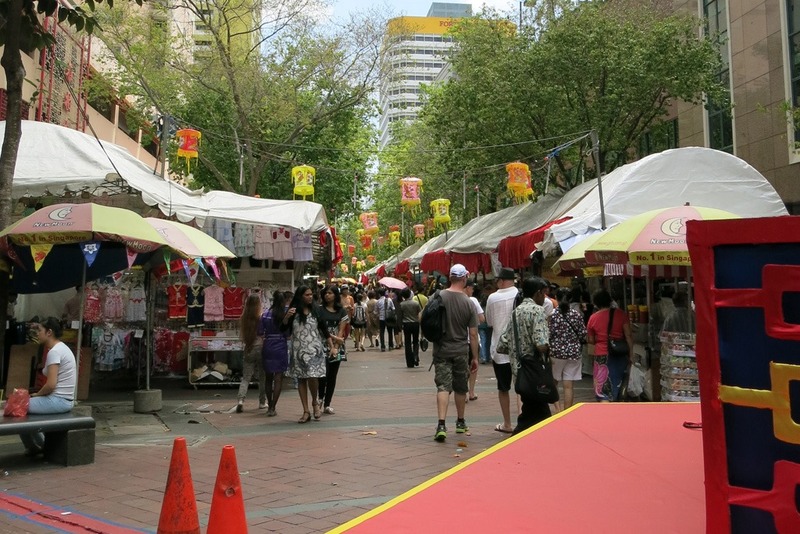 Most people will tend to just go to the Bugis Street Markets – which don’t get me wrong are a lot of fun, but a lot of the traders around the Albert Mall are geared towards locals and tend to sell some really funky unique items. 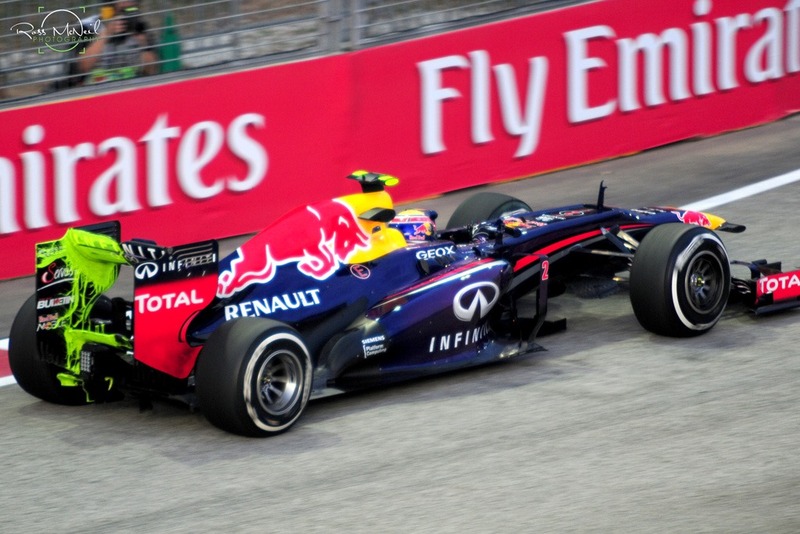 Ok so today is the first official day of the 2013 Singapore Formula 1 Grand Prix. It is Friday Practice day, the F1 cars are out for 2 sessions to tune their cars before the final practice and Qualifying on Saturday and the race on Sunday. It is also a great chance to wander around the F1 precinct without too many people around. 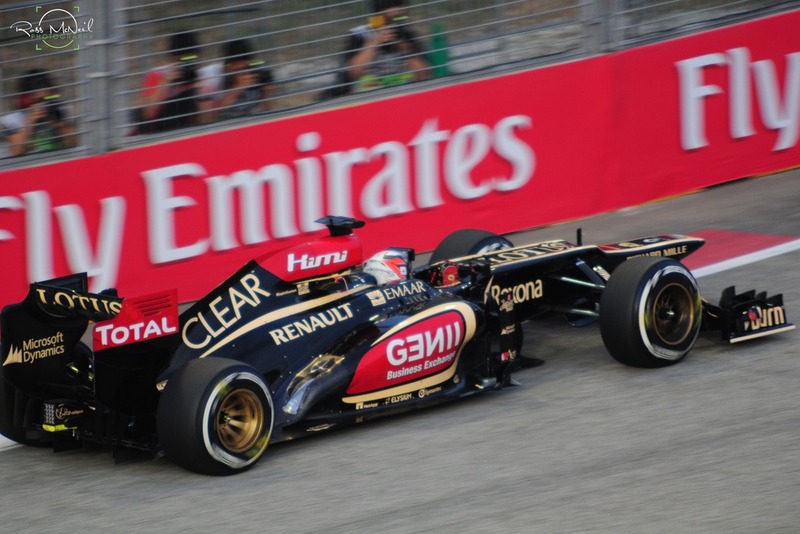 This is our third time back to the Singapore F1 Grand Prix, and the atmosphere is just amazing. 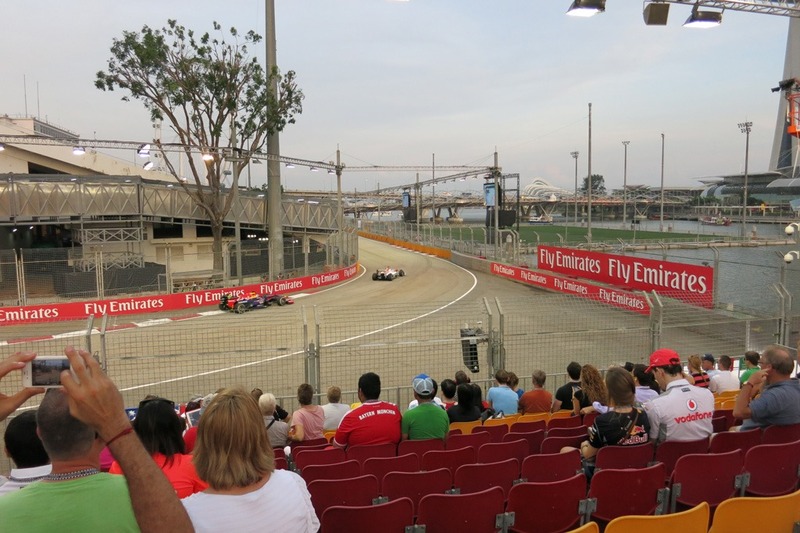 Compared to the Australian Formula 1 in Melbourne the Singapore street circuit is light years ahead. Ok so I plan on doing a few specific blog posts about the F1 itself but just as a quick guide for you. The Track: The Track is divided into 4 zones or areas; depending on what type of ticket you have purchased you may have access to only 1 Zone or you may have the whole circuit. 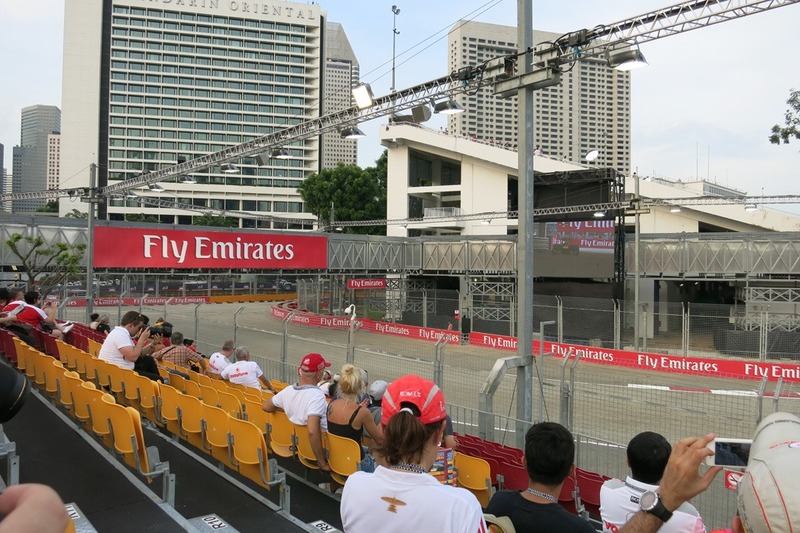 Tickets: We purchased tickets in the Esplanade Waterfront Grandstand – personally value for money I think it provides a great view of the action and depending on where you are seated you potentially get to see 3 corners of the racetrack. Tip: Seats higher up in the grandstand actually afford a better view, as you are above the safety barriers you get uninterrupted views of the cars going past. And if you sit on the far Left Hand Side (if you were viewing the grandstand from the track) you will get to see the cars take the Left Hand Turn, then the Right Hand into the Bus-Stop section, as well as the right hander under the Bay Grandstand. These tickets only allowed us access to Zone 4, but don’t worry Zone 4 is the biggest and provides the best views as well as the best food, beverage and entertainment offerings. We got to the track and had a wander around, picking up those last little bits of Merchandise and checking out some of the various food areas on the Padang. 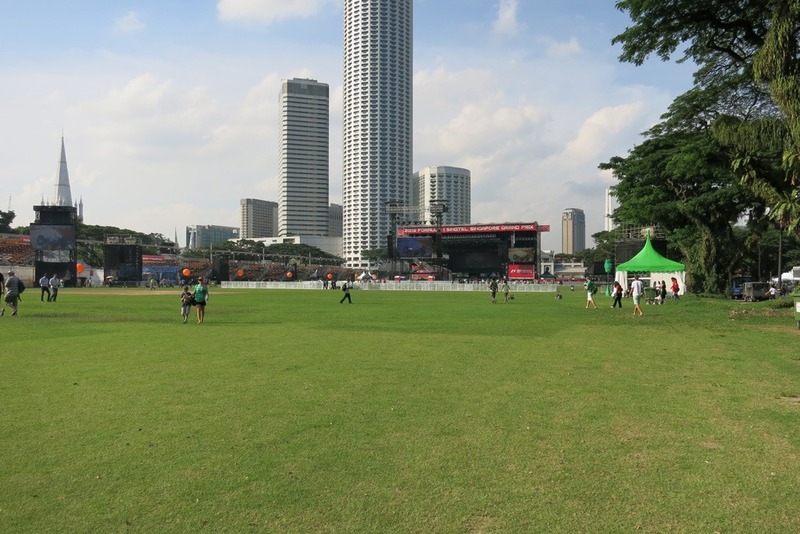 The Padang is the big open field located between the Singapore Cricket Club at one end and the Singapore Sport and Recreation Club at the other. 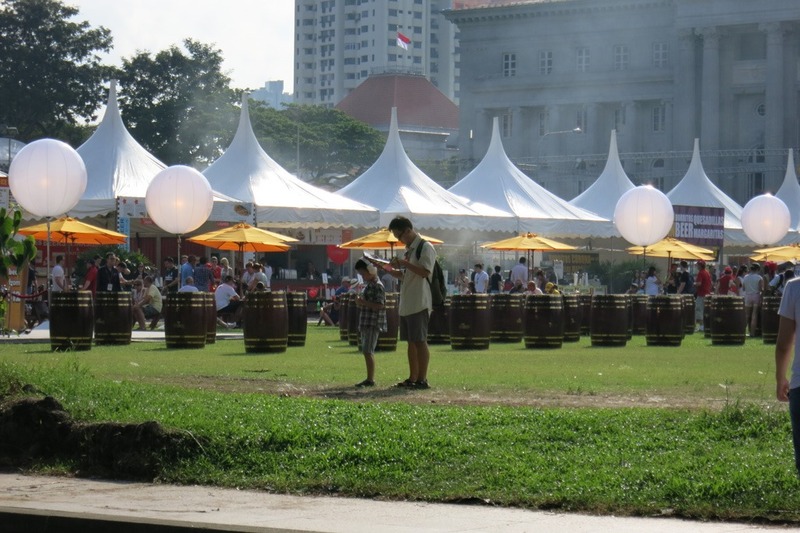 It is home to the giant stage where the nightly entertainment acts perform as well as a wide range of bars and food outlets. Our seats were in Row 12, so at the top of the first section of the Grandstand. They afforded a good perspective as you can see. There was also a large TV monitor/screen across the way which allows you to keep track of the cars when they are on the other parts of the track. The PA system was actually pretty loud so you could hear it well even with the cars coming past, but I recommend a good pair of ear protectors. We bought a set off eBay that had a built in FM radio so that we could tune in to the on-track audio during the racing. I know some people worry about the lights being too bright being a night race – but the way they are angled they don’t actually worry you too badly . Most of the light is directional and pointed downwards at the track rather than at the grandstands. So another great tip if you want to get some good shots of the cars – Friday Practice the grandstands are usually pretty empty so you can head to the top of the stand and get some great shots of the cars without the fences in the background. For those of you who are into Cameras and Photography – a little about my kit – as this was still only day 8 of a 27 day holiday I couldn’t really afford to be travelling with too much camera gear (as if such a thing could ever be possible) – so I tried to keep my kit as light as possible for this. I was shooting with a Nikon D300s Body. This is a great little Pro Body, still a DX (Crop) Sensor but overall a nice piece of kit, usually I shoot with a battery grip but due to weight considerations I left that at home. My lens is a Sigma 70-200mm F2.8. This is a fantastic sport lens and low light lens. Focus is pretty good, you do need to watch the focus a little as it does have a tendency to front-focus a little so if your camera has focus adjustment (which the D300s does) you might need to tweak it a little. Plus Depth of Field at f2.8 can be pretty brutal and unforgiving so as with everything – practice, practice, practice. I was also shooting with my Sigma 1.4x Teleconverter. This took the lens focal length up to about 280mm which when combined with a crop sensor made the total length about 450mm. More then enough to get you nice close shots from the Grandstand. Generally I was able to shoot at about ISO 640 which helped to reduce too much digital noise. The Tele-converter reduces the maximum F-stop to F4 so I had to shoot around 1/200-1/320th of a Second to get reasonably sharp images. Overall I was pretty happy with the results. To those still with me at this point – you might notice what looks like yellow paint on the back of Mark Webber’s car – you are correct, it actually is a kind of yellow paint (extremely expensive yellow paint!). It is actually aero-paint, they put it on the wing to see where the airflow is, as the air moves over the wing it actually moves the paint – so by looking at it at the end of a few laps they can get a feel for the way that the air is moving over the rear wing of the car. 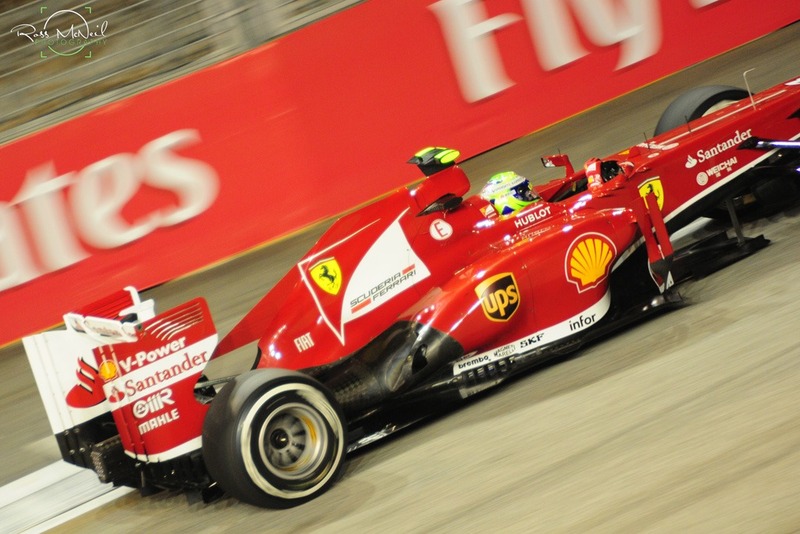 The Ferrari of Phillipe Massa – This was getting late into the session, as you can see the track lights are fully lit – the night atmosphere adds to the attraction of this event. 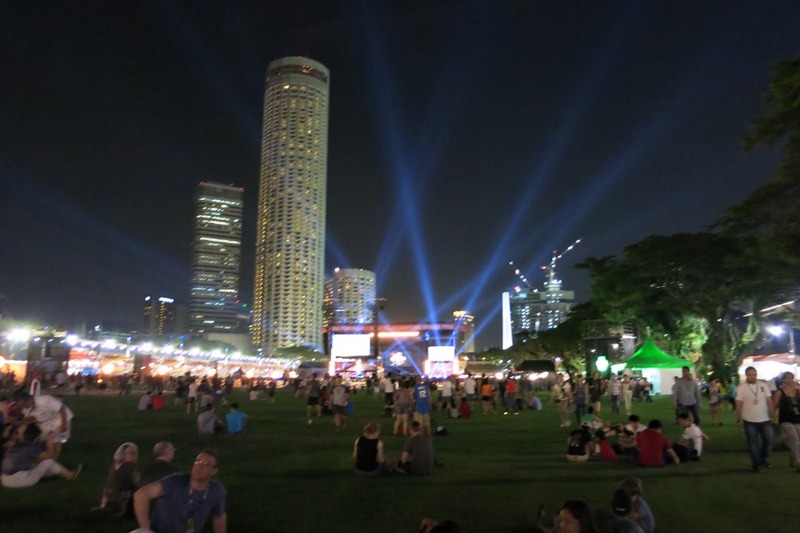 The cars glisten under the lights and the Singapore City Skyline lights up behind you to make a magical event. 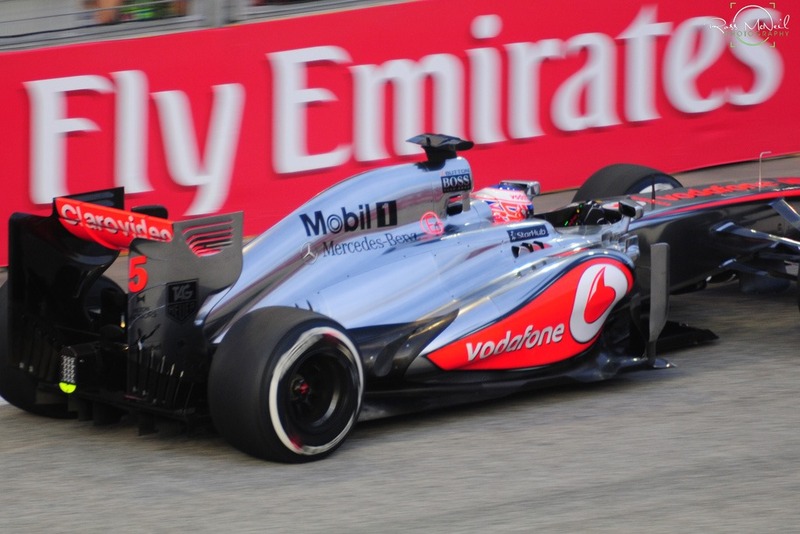 Jensen Button in the McLaren – he has had a really unlucky season this year. Frustrated by a number of technical issues. The McLaren cars have really been off the pace in general. Such a shame and it must be extremely frustrating for Jenson to be off the pace this year. 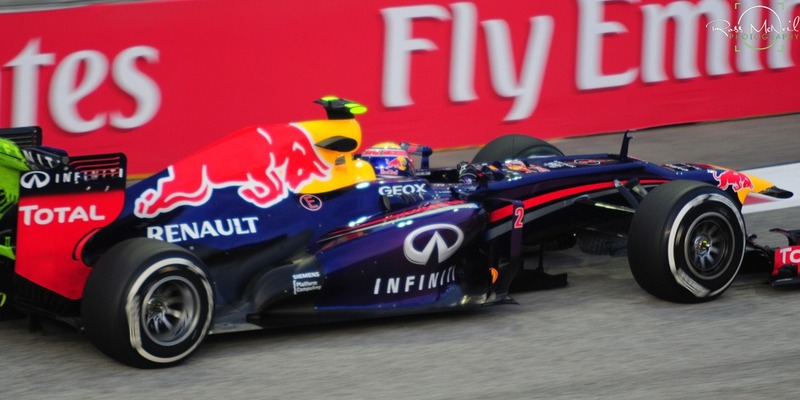 Mark Webber in his RedBull Renault Machine! 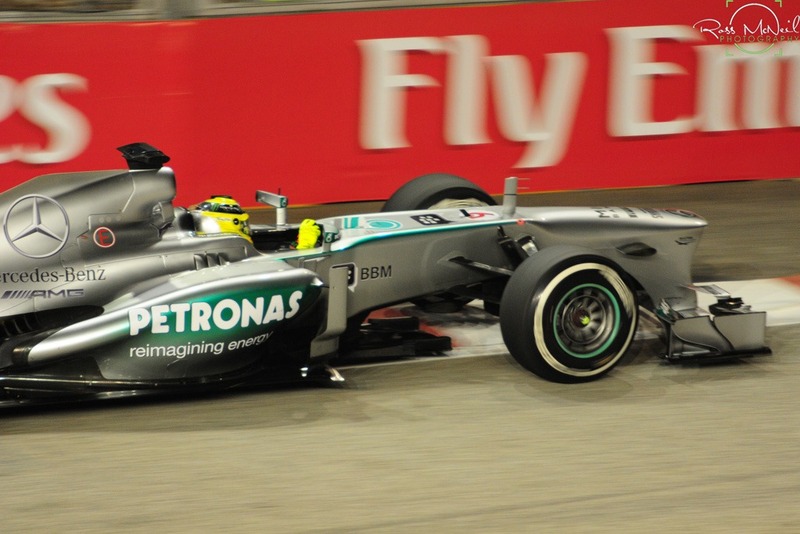 This is Mark’s last Singapore Grand Prix driving a Formula 1 Car. He announced that this season would be his last in Formula 1, next year choosing to step out of the political limelight of F1 instead he will be driving for Porsche in the LeMan Sportscar series. 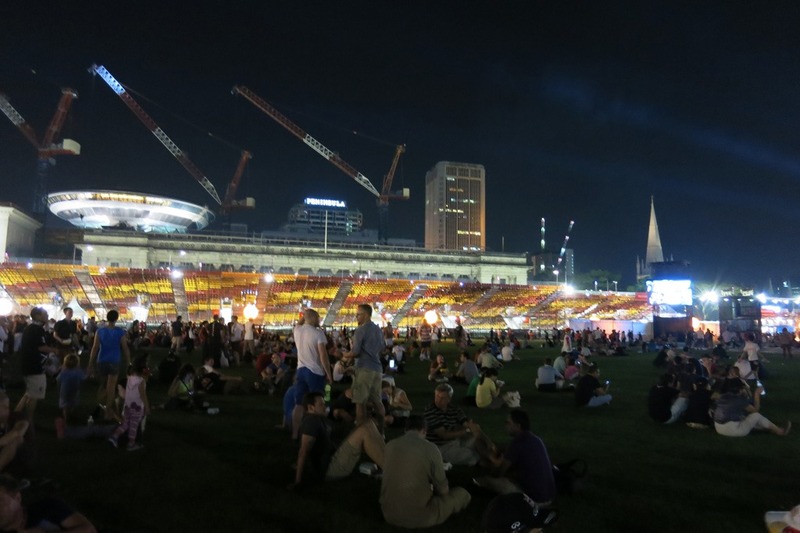 But the Padang is a really cool venue for a concert, it can easily hold around 50,000 people so is a great place to sit back and have a drink at the end of the night. We eventually left the track at around 11pm and headed back to the hotel. 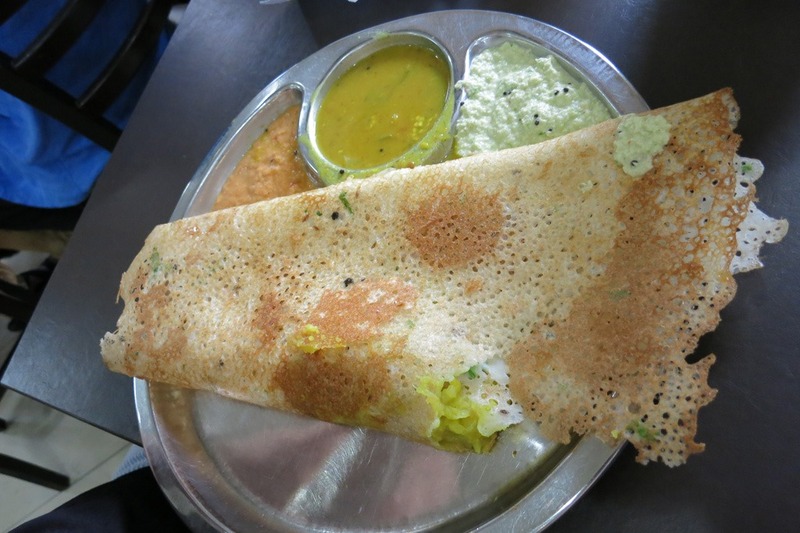 But we couldn’t resist a quick late night stop at our favourite little late-night spot – Al Jilani – it is a 24 hour Indian Restaurant on Bencoolen Street – literally across the road from the Ibis Hotel. I can’t believe in 2 previous trips to the Ibis Bencoolen we haven’t checked this place out! We had the Roti Prata and of course – Iced Milo! The perfect midnight pre-bed snack! Bread and Sugar Drink! Ok that is it for tonight folks – thanks for reading along. Hope that you enjoyed today. Tune in tomorrow, and please as always leave me a comment to let me know what you think of my blog. Thanks!